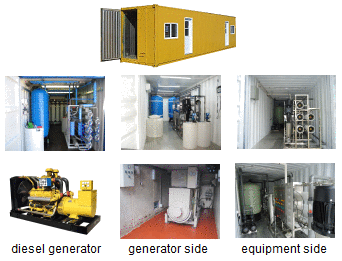 General description: containerized (mobile) water treatment plants, fully automatic, intended for processing of any kinds of raw-water sources (tap-water, wells, rivers, lakes, dams and/or seawater) to obtain a high quality drinking water according to the WHO Guidelines. Containers are fully equipped and ready to use, independent of central electricity for producing of drinking water for public buildings, schools, factories, villages, resorts, military bases, hotels, rest-houses, etc. Low maintenance costs, easy for operation and maintenance.